The mighty Manchester United have an epic European night in Manchester, they welcome the fearsome Paris Saint Germain in a last 16 UEFA Champions League test. There’s extreme excitement and big expectations on Ole Gunnar Solskjaer’s in-form Red Devils this evening. United could take a big step towards where they belong: the UEFA Champions League last eight to battle the great clubs of Europe. Futaa takes a quick look back at how United have fared in the last five seasons in the competition. Lead by David Moyes, United easily made it out of the group unbeaten, doing the business against the likes of Bayer Leverkusen, Shakhtar Donetsk and Real Sociedad. The first away challenge in the last 16 round was a 2-0 loss at the harsh territories of Olympiacos, but the Red Devils delivered the perfect reply at Old Trafford with a 3-0 victory. However, Bayern Munich were waiting in the quarter-finals. Moyes’ side drew 1-1 in England before a 3-0 hiding in Munich. This was a season to forget. The Red Devils failed to make the Premier League’s top four in 2013/14 when they finished seventh. United faced a lot of scorn while they watched the Champions League on television. Back in Europe following the previous season’s shock absence. The 1999 champions were grouped with PSV Eindhoven, Wolfsburg and CSKA Moscow. This placed United as obvious favourites to make the last 16...surely. But a complete meltdown under Louis Van Gaal resulted in a shock group stage exit. 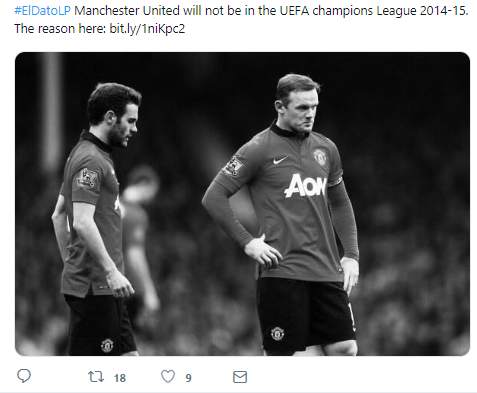 After dropping down to the Europa League, Van Gaal’s men would go on as far as the last 16 where they eventually lost to bitter rivals Liverpool over two legs (2-0 at Anfield, and 1-1 at Old Trafford). United’s fifth finish in the Premier League meant another embarrassing absence from the continent. The result also marked the end for Van Gaal. Enter Jose Mourinho to lead United in the Europa League. The Portuguese took the side all the way to lift the 2016/17 Europa League title after beating Ajax Amsterdam 2-0 in Stockholm, Sweden. There would be no worry to fight for a European place in England. The Group stage draw set up jobs against FC Basel, CSKA Moscow and Benfica.The Red Devils breezed through the phase with five wins and one loss, setting up a last 16 clash with Sevilla. A very drabby 0-0 draw in Spain was followed by a shock 2-1 loss at Old Trafford. Just like that, United were out of the Champions League at the hands of Sevilla and this drew the beginning of the end for Mourinho. United’s second place finish last season and success in the group stage is why we are excited for tonight. Mourinho found the necessary results against Young Boys, Valencia and of course the famous 2-1 win in Turin over Juventus. The job set up tonight’s epic clash with Paris Saint Germain at the theatre of dreams. Manager Solskjaer and his men know that tonight’s result will play a big role in deciding whether United will make their first Champions League quarter final in five seasons.